“Although, it’s already too late for us to understand and involve in Southeast Asia, it’s better than nothing. But we must know, the New Southbound Policy is not resource grabbing, not based on imagination, not hiding in AC rooms translating foreign books, not paper talk policy, nor short term investment. The New Southbound Policy needs comprehensive, substantive, long-term and in-depth policies and actions”—-Ted Tsung-Te Tsai, Prof. of Graduate Institute of Ethnomusicolopy, Tainan National University of the Arts. This is the Second year of the New Southbound Policy, and how much do we know about Indonesia’s true art and culture? It is not tropically exotic, or on the surface Southeast Asian style, nor the international art packaged with the Western Arts Festival style. Indonesia, due to its special ethnic regionalism and its historical context of colonial resistance, always has a strong spirit of origin. As the largest country in southern hemisphere Asia, the large main island “Java Island” is the most populous island in the world. Because of its colonial history of the Dutch East India Company in modern times, it has abounding multicultural society and near to Australia, not only preserve lots of special traditional spirits, but has international perspective. 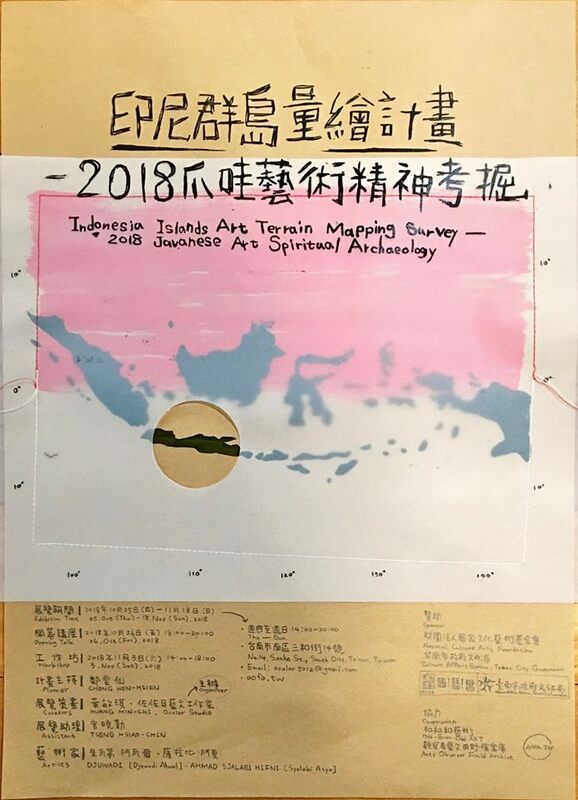 The Ocular Studio, based on more than a decade’s Indonesian research, is arranging a series of ” Indonesia Islands Art Terrain Mapping Survey “, which will present a long-term and in-depth study on Java, and invite Indonesian artists and art group based on different topics each year, wishing to gradually shape the true perception of the Indonesian art environment for Taiwan. The productive artist Syalabi has never been abroad, and can’t speak in English. The artist Djuwadi didn’t learn from the art university system, but from the experience of printmaking, which involved a social movement and research assistance which is much more than most of Indonesian artists. The two artists will present examples of today’s spiritual art scenes in Java, Indonesia, but exclude the art gallery/commercial gallery aspects. Specifically, the exhibtion will also present the field investigation archives and collected artworks of Jave Island since 2004. The exhibition poster is a complete process of manual labor, combined with prints, hand-painting, sewing, scrapbooking, handwriting, and natural materials of banana leaves. It is a full-fledged expression influenced by the Indonesian art spirit. [Ocular Studio]: Established in 2011, operating a non-profit art criticism writing platform “Arts Observer Field Archive” //aofa.tw. The main research direction is the history of Taiwan art development, encouraging the resource sharing and cooperation of researchers, paying attention to the transition and development of contemporary art phenomenon domestically and abroad, and cooperating with the indie-spaces in Tainan. [Huang Min-Chi]: Graduated from Graduate School of Plastic Arts, National Taiwan University of Arts. Was greatly influenced by early years researching Indonesian contemporary political art. Loves to do sui generis things, and often is out of tune with the art circle. The artwork crosses between performance, woodcarving and writing, and is often immersed in the translation Tower of Babel. Raising two boys currently.